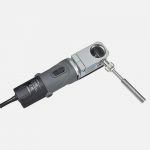 It is equipped with an integrated, replaceable dust filter, protecting the operator and the environment against the potentially harmful dust produced during electrode grinding. The MasterPoint Handy is able to grind electrodes as short as 15mm with a standard electrode clamp and 8mm with a special electrode clamp. It also has an inspection cover enabling the operator to view the grinding operation.